Question: How long were the children of Israel in Egypt? 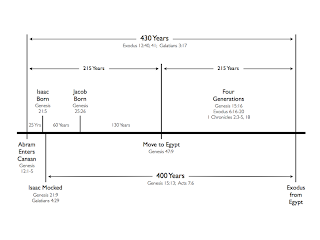 Two measurements are given: four hundred years, and four generations. Before we look at the four-hundred-year prophecy, we notice that Israel's sojourn in Egypt was to last for four generations. We can confirm that that turned out to be the case. Levi and Judah represent the generation that went into Egypt. Moses and Caleb represent the generation that left Egypt. 1. Abraham's seed were to sojourn in a strange land for four generations. 2. Abraham's seed were to be afflicted and treated evil for 400 years. Examples of Abraham's seed being treated evil may be found in Genesis 27:41; 31:7; 37:28; 39:20; and Exodus 1:11. The first instance of Abraham's seed being mistreated was when Isaac was mocked by Ishmael in Genesis 21:9. Paul described it as persecution in Galatians 4:29. From that event we may count the predicted 400 years to Israel's deliverance from Egypt. Another inspired reckoning of this period is given in Exodus 12:40, 41. "Now the sojourning of the children of Israel, who dwelt in Egypt, was four hundred and thirty years. And it came to pass at the end of the four hundred and thirty years, even the selfsame day it came to pass, that all the hosts of the Lord went out from the land of Egypt." So the law was given 430 years after God's promise was made to Abraham. The law, of course was given on Mt. Sinai at the time of the Exodus. Abraham received God's promise when he was 75 years old in Genesis 12:1-5. From that time we can reckon 430 years to the Exodus. Starting from God's promise to Abraham we may count 25 years to Isaac's birth (Genesis 21:5), then sixty years to Jacob's birth (Genesis 25:26), then 130 more years to the time when Jacob's family moved to Egypt (Genesis 47:9). That adds up to 215 years from Abraham's entrance into Canaan until his descendants moved to Egypt. 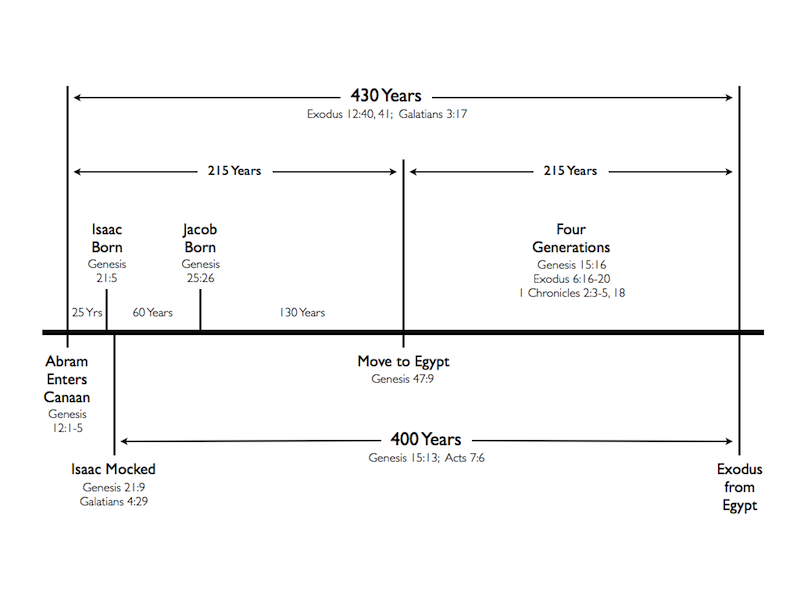 Of the 430 total years, that leaves 215 remaining years as the amount of time the Israelites actually spent in Egypt. That fits well with the time span of four generations.